Church Mutual is always adding to our library of safety materials for camps and conference centers. The materials shown below are all available to our customers at no charge. Some of our other safety materials also are appropriate for camps and conference centers, so feel free to browse the various areas of our Safety Resources library using the links in the gray bar to the left. 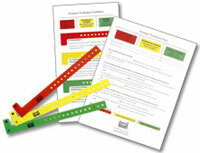 To review the safety materials available just for camps and conference centers, click a link below. Learn how to identify and help prevent bullying and other types of abuse to protect the safety of children and youths at your camp. Download video guide. Evaluation forms, guidelines and color-coded wristbands to ensure your swimming activities are fun, exciting and safe for all participants. Church Mutual’s swimmer bands are available to our customers only at no cost. Include swimmer evaluation sheets (one per swimmer)? Include laminated guidelines for supervisors? Use this checklist to inspect your camp or conference center to make sure safe operation is being maintained throughout your campus and with all of your activities. Camp security experts John Ojeisekhoba and Craig Herrick of J&O Emergency Management and Security Consultants discuss how to prepare year-round and seasonal staff for a security emergency at camp, including an active shooter incident. Bees, wasps, and mosquitoes – oh my!